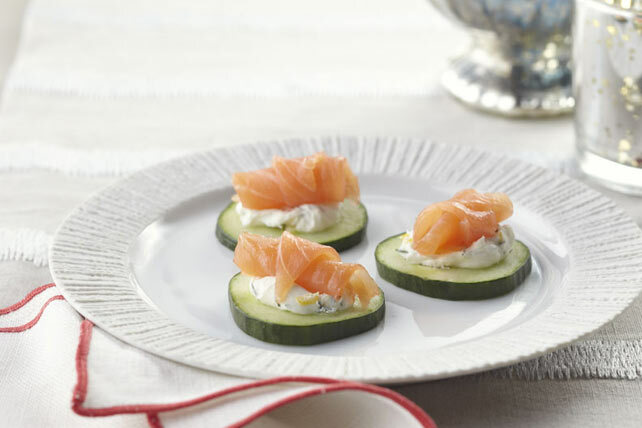 Fresh cucumber slices are the perfect crisp base for these easy-to-assemble salmon-and-cream cheese appetizers. Simply double the ingredients if you need appetizers for a crowd! Mix cream cheese product, dill and zest until well blended. Roll up salmon pieces; place over cream cheese mixture. Prepare using your favourite flavour Philadelphia Whipped Cream Cheese Product. For an elegant touch, instead of chopping the dill, tuck a small sprig of fresh dill into each rolled salmon piece. An English cucumber is long and thin with few to no seeds. Since the skins are not waxed, they do not need to be peeled.